Here we go again - Bob and Jesse, our two man engineering team, are back in the sound laboratory developing the next Source Audio effects pedal. Please feel free to check in on this page anytime for the most recent updates in the development process. And of course, we want to hear your thoughts and suggestions - head over to The Gear Page and join our conversation about the new pedal. First we need to explain the big idea behind our new project. 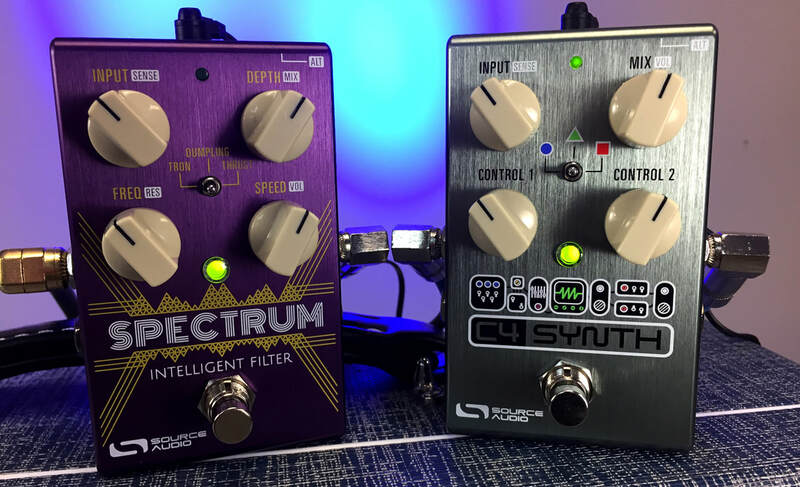 Bob Chidlaw, Source Audio's Chief Sound Engineer, has built a powerful filter / octave / synth architecture for the One Series line of pedals. The current plan is to release two pedals: an Envelope Filter (the Spectrum Intelligent Filter) and a Guitar and Bass Synthesizer (C4 Synth). Out of the box both pedals offer a simple 4-knob interface and a choice of three different filter or guitar/bass synthesizer effects, but beneath the hood the pedals share the same underlying program and Neuro Effects Editing compatibility. What that means is that sounds created for the C4 Synth will also be available to the Spectrum Intelligent Filter and vice-versa. The true power of the C4 Synth and the Spectrum Intelligent Filter resides in their Neuro Desktop or Mobile Editing interfaces. Source Audio President Roger Smith said in a recent interview, " When we create our own library of sounds, we put them out, and they have a certain level of popularity. But it has been far more interesting to tap into the world of hobbyists interested in creating their own sounds with our Neuro Desktop Editor. They create presets and publish them into a communal sharing space where others can use and further edit them. Creating this kind of collaborative world is ultimately the kind of direction we’re heading." With the Neuro Editor it will be possible to create highly customized presets for your C4 Synth or Spectrum Intelligent Filter. Presets can then be published and made available to the entire Neuro community. The illustration below shows the current state of the C4's Neuro Desktop Editor. You will see that it is possible to edit each to the C4'a four voices, including things like Oscillator Wave Shapes, Envelope Types, Filters, Distortion, FM Synthesis, Pitch Shifting, Harmonization, Sequencing, and much more. We cannot wait to hear the sounds created by the ever-growing base of Source Audio pedal owners. The block diagram below illustrates the current architecture of the C4 Synth and Spectrum Intelligent Filter. It provides a look at the internal signal path of both pedals. There are four Voice Blocks. Within each Voice Block it will be possible to selects from any of the following Voice Types: Dry Signal, Octave, Mono Pitch Shifting, Polyphonic Pitch Shifting, Synthesizer Sine Wave, and Synthesizer Square Wave. In these blocks you will also be able to select voice level, stereo panning, distortion/fuzz engage, filter engage, pitch modulation, and detuning amount. Choose a type of distortion from a long list of Source Audio favorites, including Multiwave, Soft Clipping, Foldback, and Gated Fuzz. Dial in the Drive amount and Clean/Dirty Mix.